The lumbar area of the back takes the biggest strain due to the bent over position and the forward flexion of the spine whilst swinging. As the body rotates through the swing, the core muscles work alongside the muscles of the lower back. The greater the power exerted through the swing, requires a larger force created by these muscles and therefore greater risk of injury. To reduce the risk of injury to the back from the repetitive movement of swinging in golf, it is important to strengthen and stretch core and lower back muscles. The erector spinae and abdominal obliques are the muscles utilised most in golf, therefore the focus of strength and conditioning specific to golfers should target these muscles. 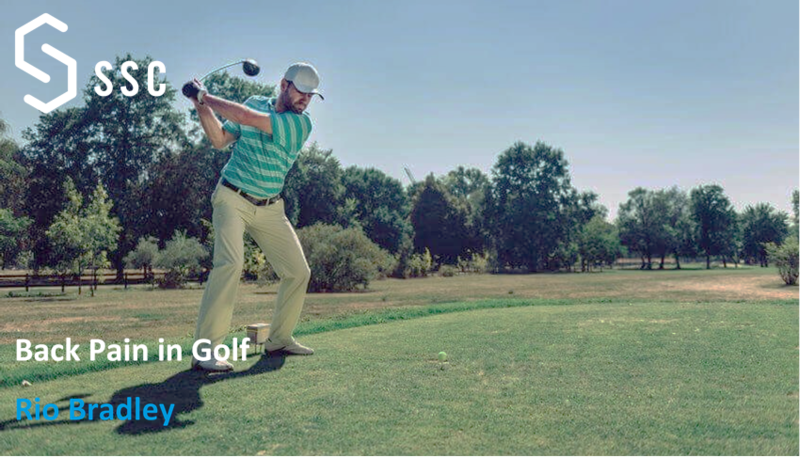 To transfer the strength to power for a great golf swing, the golfer needs to have tight control of the trunk to protect the back through all phases of the golf swing (backswing, downswing, impact and follow through). Firstly it is crucial to incorporate a thorough warm up prior to swinging. The aim of the warm up is the increase heart rate, blood flow to the muscles delivering oxygen, elevate metabolism and prepare muscles for movement. The warm up should incorporate stretches, not only to reduce injury risk but enhance performance. Golf specific stretches such as hip rotation, shoulder stretches, side bending and back extension/rotation are recommended. A strengthening program specifically directed to reduce the risk of back injuries is ideal for golfers who have previously had a back injury, using it as part of rehabilitation program or for any golfer hoping to avoid future back injuries. Strengthening programs should involve exercises directed at abdominal and lumbar muscles to reduce back injury risk, but should also incorporate hip flexors/extensors and upper extremities to prevent injuries elsewhere and improve power in the swing. • Bridges with and without the use of a BOSU ball. If you would like SSC services for specific golf rehab, technique assessment or any information regarding this article please contact the team. McCarroll, J., Rettig, A. and Shelbourne, K. (1990). Injuries in the Amateur Golfer. The Physician and Sportsmedicine, 18(3), pp.122-126. Reed, J. (2005). Strength and Conditioning Strategies to Reduce the Risk of Lower Back Injuries Associated With the Golf Swing. Strength and Conditioning Journal, 27(2), pp.10-13.